How did I manage to buy an ecru dress shirt? 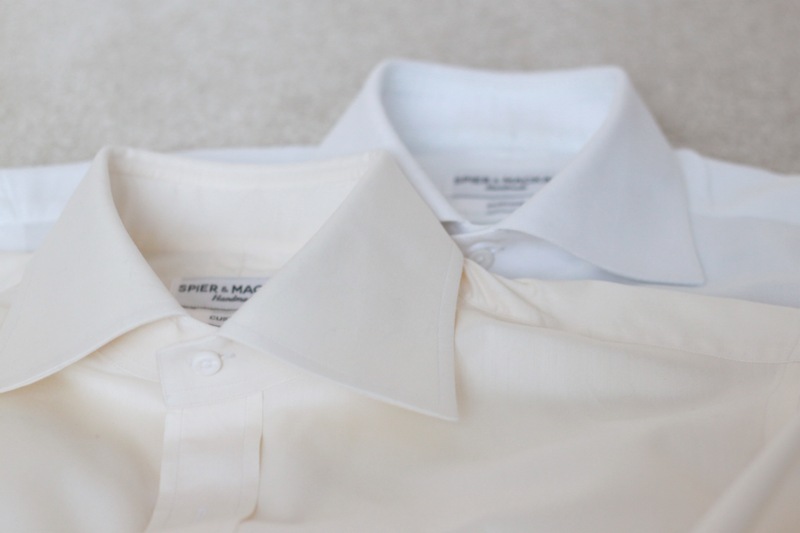 When I first started buying dress shirts, they were mostly white. Then, after spending some time on Instagram and Style Forum, they were mostly blue. Then patterned blue with houndstooth, pencil stripe and the like. On my latest custom order from Spier & Mackay I wanted something different. Pink is often a tertiary colour in men’s shirt collections, but I didn’t see any fabrics I liked – they were either too saturated, or not a pattern I’d wear. I had a grey pencil stripe that no longer fits but it was sometimes tricky to pair (though I am looking to replace at some point). A few thoughts directed me to think about an ecru dress shirt as a viable option. In my post about white dress shirts, I mentioned one of my “rules” being that I don’t generally pair a white pocket square with a white shirt. One of the stand-ins is having a cream coloured pocket square. Seemed to me that the versatility of this colour could be applied to a shirt in the same way. In that post, I also mentioned that I’m wearing white shirts more. Sometimes a blue shirt is too “cool” in colour relative to the rest of the pieces in the outfit. If that is the case, I will reach for white. Sometimes a white shirt is too stark in contrast for the outfit. Now I can reach for something else – the ecru dress shirt. Yellow shirting has a home in the Ivy/Trad circles, though it would generally be an oxford cloth button down, and decidedly yellow as opposed to cream/ecru. It’s still an area to draw inspiration from. In this example, I don’t think there was a better choice than the ecru dress shirt. 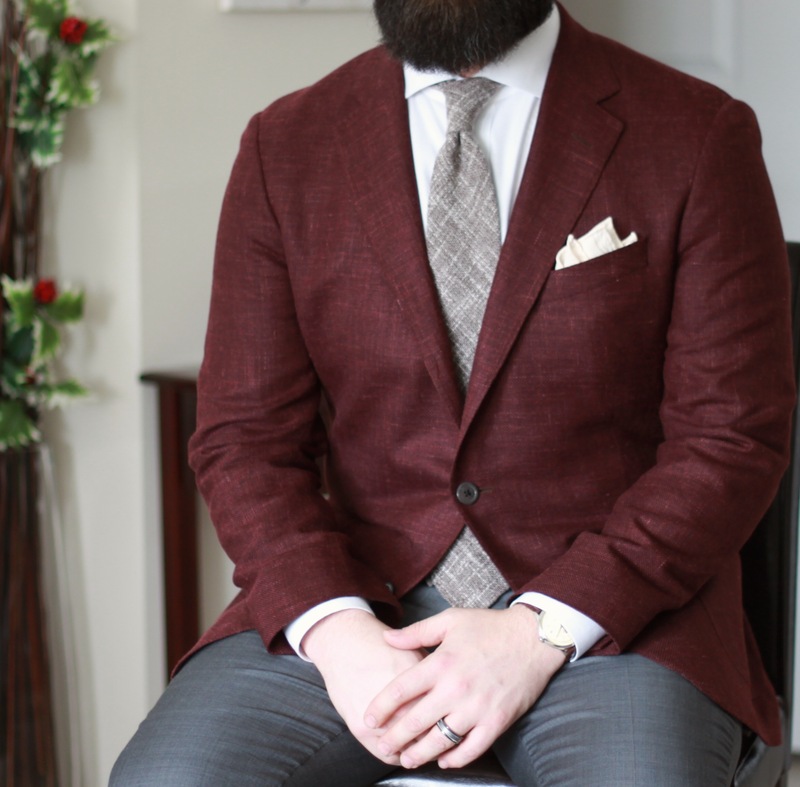 The trousers are a warm mid-grey, the jacket is an oatmeal base, with houndstooth checks in caramel, brown, grey and green, and the tie is a deep burgundy grenadine from Sam Hober. Overall this is a “warm” oufit, and a perfect example of what I mentioned above: blue would have been too cool, and white too stark. 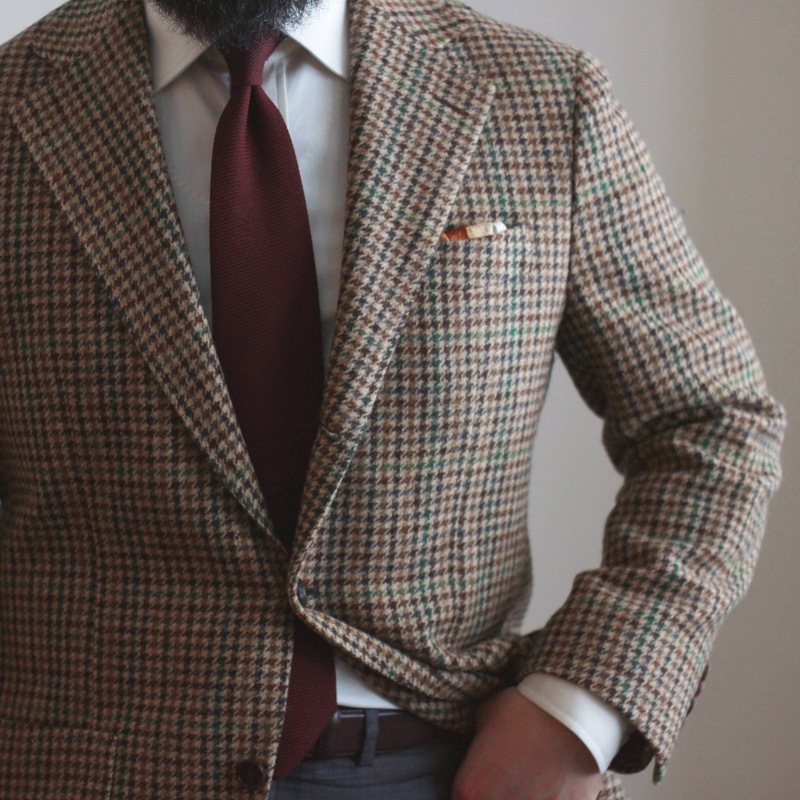 I like that the ecru dress shirt gives the tie a bit of a brown cast that helps it pair with the jacket. If I’d chosen white or blue, the tie would appear much more red. Finishing off this look is a pocket square folded to show brown, caramel and cream colours. Creamy colours work well with grey. 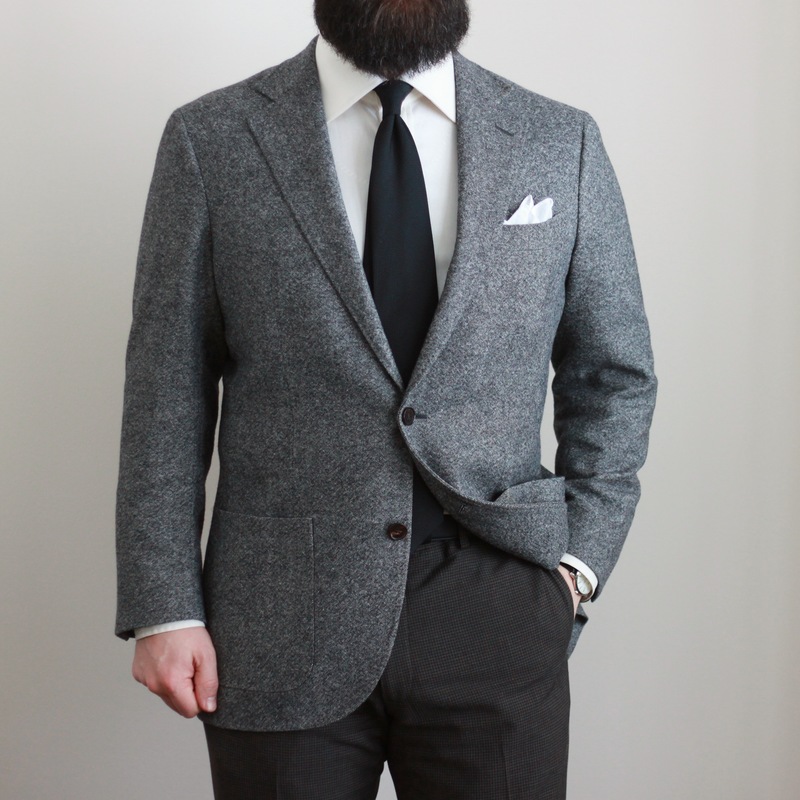 In this outfit, I’d chosen brown trousers and my grey merino tweed jacket to pair with the ecru dress shirt. I didn’t want to introduce another colour into the mix, so I kept the accessories as shades (black faux grenadine tie and white pocket square. I think a white shirt would have been fine here, but the ecru dress shirt does a nice job of warming up the top half, and adding some continuity with regards to the brown trousers. The shirt also softens the contrast ever so slightly, allowing the main points of contrast to be the tie and pocket square. The trick with an ecru dress shirt is to find a shade that shows your intention is clear. It shouldn’t present a sallow, dingy effect that looks like you forgot to do laundry! I also wanted to stay away from something overly yellow, as it would not look good against my skin tone. The shirt fabric I chose has a hint of yellow, but leans more toward a creamy, ivory colour. Here’s a picture of it up against a pure white dress shirt. I really enjoyed the colours in this one. 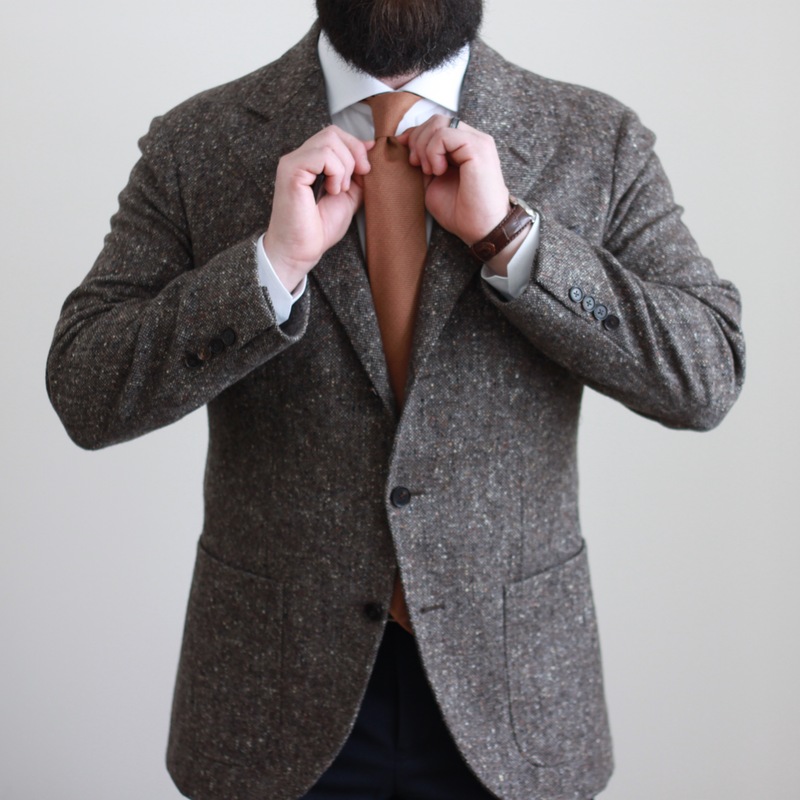 Especially this tie and jacket – the granola hopsack from Vanda picked up some of the caramel-toned flecks in the Donegal jacket. The navy trousers worked nicely as a contrast to the orange-y pieces in the top block. Based on the colours and textures here, the white shirt was an ok choice. I think a light blue might have worked well by adding some “cool” continuity up top to balance out the warmth. An ecru dress shirt would have reduced a bit of the contrast, and connected the jacket and tie a bit more. The white shirt in this one was chosen specifically for the contrast and neutrality it provided. Also, because a blue shirt wouldn’t have worked here. I think my ecru dress shirt would have fit well, and I’m interested to see how it pairs with this burgundy jacket. I think the brown and white threads in the tie would stand out nicely against a creamy background, though had I chosen ecru the cream square would have to be replaced. I’m really happy that I went a little outside my comfort zone on this purchase. I’m finding the ecru dress shirt to be even more versatile than I’d thought, and it will continue to have a home in my wardrobe. Spier & Mackay offers a great shade that isn’t too yellow, and isn’t dingy looking. The fabric itself is great. It has a nice weight to it, and it irons really well. After a couple of washes, no shrinkage to note. It’s a bit hard to find, buried in the custom section and you need to filter by colour – white, not yellow – to get to it. Due to the nature of the custom section of their site, I cannot link to it directly here. I’ll say the photo of it is much more washed out than in real life. So, have I made a compelling enough case for a yellow(ish) dress shirt? Just sold off an ecru shirt from Ratio Clothing on eBay because it was too yellow. I agree that cream/ivory is the way to go. I like them with brown sport coats and suits and have one from SuitSupply that fits the bill decently, though it’s kind of like a micro-corduroy, so limited in use. I imagine this is the ecru pinpoint oxford from Spier & Mackey? Your summer experiment should be their lemon yellow stripe. You are correct! This is the pinpoint oxford from Spier & Mackay. It’s a great fabric. I will have to take a look at this lemon yellow stripe. Thanks for the suggestion! I love this article. I myself have started to branch out into uncommon dress shirt colors (such as greens, yellows, and purples). You’re right that they add a warm touch. I love how different they are without being too bold of a color. I have found a new blog that I will regularly read and you have earned a new reader. Cheers. Exactly! I enjoy the challenge of finding ways to pair a different coloured shirt. I’m glad to hear you enjoyed the post. Thanks for the comment!